Pallet Rack Safety Banners™ for the ends of your pallet racks. 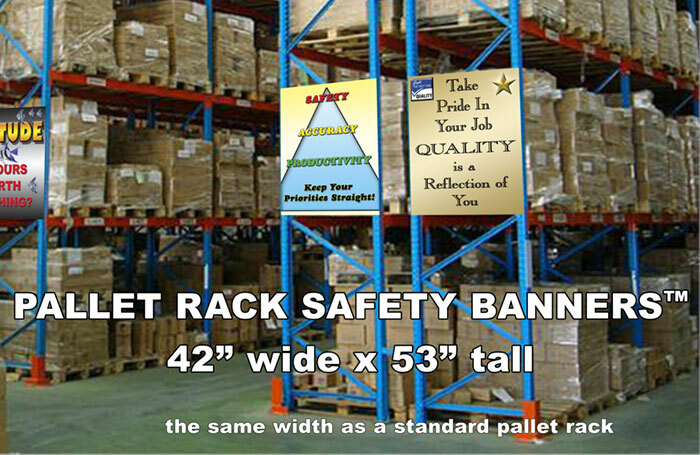 Pallet Rack Safety Banners™ are another safety innovation from SafetyBanners.Org. Pallet Rack Safety Banners™ go on the end of your pallet racks. (Available in vertical image format only.) Safety Rack Banners are 42 inches wide (the width of a standard pallet rack end frame) by 53 inches tall. Put your safety message where employees will see it every day all day long. NOTE: For a limited time we are offering FREE pallet rack safety banner™ design. Also, custom sizes are available. Each pallet rack safety banner™ comes fully grommeted with nickel-plated grommets (won't tarnish like the lower cost brass grommets) and strapping ties for a secure attachment to your rack frame. Pallet Rack safety Banners™ are available in standard vinyl and mesh, which has limited view-thru capability from the back side. When you expect the best, we deliver. PLUS, we can create specialty banners for any warehouse situation or need. We can make the in a horizontal format for overhead use or a vertical format to cover an entire pallet rack end. Email us, top center email us button, or call us at 901-759-0932, Central Time. We can create a banner to meet any need you may have. SafetyBanners.Org is the Safety division of New Tech Graphics located in Memphis, Tennessee. With several million dollars in sales, and producing over 14,000 banners a year, New Tech Graphics is the largest and most innovative producer of Safety Banners in the United States. Our Quality & Satisfaction are 100% Guaranteed!! Proud to have served and proud to be veteran owned and operated. Innovative products and safety banners from SafetyBanners.Org.